The author of many world-famous canvases, Russian genius Ilya Repin in 1877 created another masterpiece of genre painting. The work is called “Return from the war.” A multi-figured composition with deep social overtones appears to the viewers. The central figure is a young soldier, with a broad smile and enthusiasm telling military tales to his surprised country listeners. In the picture one can see the author’s ironic and even accusatory attitude towards the behavior of the fighter. The guy returned to his native village with a minor injury: his forehead was bandaged, his right arm was tied to the neck. In the guise of a young man noticeably content with himself, his relaxed, cheeky posture makes fellow villagers shy. Soldiers’ tales upset women in the hut. Men react differently: the young man opened his mouth in surprise, mature and elderly men listened with interest. A severe-looking mustache man even lit a cigarette. One would like to become a participant in the show, in order to hear the story that aroused everyone. Repin wrote everyday historical painting in the style of realism. Simple, unpeeled clothes of people reliably convey the state of the people in the postwar period. The decoration of the hut is modest and gloomy. But the bright emotions of joy and revival of the people gathered here distract attention from the inconspicuous situation, painting the atmosphere of the canvas with bright colors. In a far corner, a woman in black robes seemed to be hiding. She is not attracted by what is happening in the house. Mother or someone’s wife is filled with grief – she mourns the dead, those who did not return like this joyful soldier. 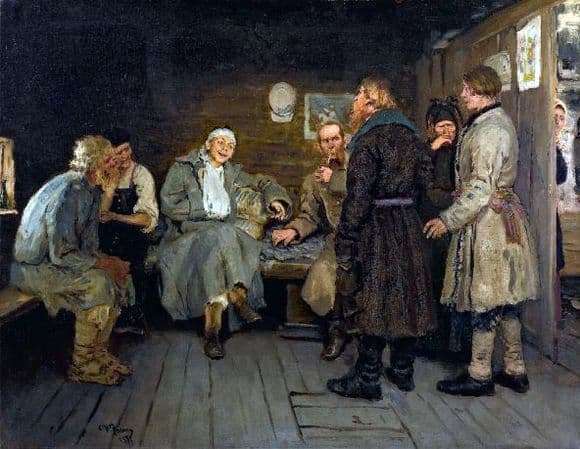 The Russian painter was once again struck by the skill of creating a genre scene where all the characters bear individual traits and are absorbed by various feelings. The Return from the War is in the Estonian Art Museum of the capital.